The 1, 2, 3, 4, 5, 6, 7, A, C,D, E, F, L and N trains will be affected by service changes this weekend. NEW YORK CITY— A total of 14 subway lines will be affected by service changes this weekend, mainly due to construction work aimed at upgrading and maintaining the tracks, the MTA said. 1 trains will be suspended in both directions between 14th Street and South Ferry from 11:30 p.m. Friday to 5 a.m. Monday. Free shuttle buses will provide alternate service between Chambers Street and South Ferry. East 180th Street-bound 2 trains will run express from Wakefield-241st Street to East 180th Street from 3:45 a.m. Saturday to 10 p.m. Sunday. 2 trains will run local in both directions between Chambers Street and 34th Street-Penn Station from 11:30 p.m. Friday to 5 a.m. Monday. between Flatbush Avenue-Brooklyn College and East 180th Street and via the 5 line to and from Eastchester-Dyre Avenue and between East 180th Street and Wakefield-241st Street. To continue your trip, transfer at East 180th Street. 3 trains will skip Rockaway and Van Siclen avenues in both directions at all times until the end of the winter. Use free shuttle buses instead. For service to and from Rockaway Avenue, use shuttle buses to and from the Saratoga Avenue station. B60 customers can transfer to and from shuttle buses at Rockaway Avenue. For service to and from Van Siclen Avenue, use shuttle buses to and from the Pennsylvania Avenue station at all times. Free transfer is available with MetroCard. 3 trains will run local in both directions between Chambers Street and 34th Street-Penn Station from 6:30 a.m. to midnight Saturday and Sunday. 4 trains will skip Rockaway and Van Siclen avenues in both directions at all times until end of the winter. 4 trains will also skip 103rd Street at all times until the end of Spring 2016. Use the nearby 96th Street or 110th Street stations instead. For Service to this station, take an uptown 4 or 6 train to 125th Street and transfer to a downtown 4 or 6 train. Or take an uptown 4 or 6 train to 110th Street and transfer to a downtown M101, M102 or M103 bus. For service from this station, take a downtown 4 or 6 train to 96th Street and transfer to an uptown 4 or 6 train. Or, take an M101, M102 or M103 bus to 96th Street and transfer to an uptown 4 or 6 train. Transfer between trains and buses is available with MetroCard. 5 trains will be replaced by 2 trains between Eastchester-Dyre Avenue and East 180th Street from 3:45 a.m. to 6 a.m. Saturday and from 11 p.m. Saturday to 8 a.m. Sunday. Pelham Bay Park-bound 6 trains will skip 103rd Street at all times until Spring 2016. Use the nearby 96th Street or 110th Street stations instead. For service to this station, take an uptown 4 or 6 train to 125th Street and transfer to a downtown 4 or 6 train. Or take an uptown 4 or 6 train to 110th Street and transfer to a downtown M101 M102, or M103 bus. For service from this station, take a downtown 4 or 6 train to 96th Street and transfer to an uptown 4 or 6. Or, take an M101, M102, or M103 bus to 96th Street and transfer to an uptown 4 or 6 train. Transfer between trains and buses is available with MetroCard. Pelham Bay Park-bound 6 trains will run express from 3rd Avenue-138th Street to Hunters Point Avenue from 11:45 p.m. Friday to 5 a.m. Monday. Hudson Yards-bound 7 trains will run express from Mets-Willets Point to Queensboro Plaza from 5:45 a.m. to 11:59 p.m. Saturday and and Sunday. Hudson Yards-bound 7 trains will also run express from Mets-Willets Point to 74th Street-Broadway from 3:45 a.m. to 7 p.m. Sunday. Brooklyn-bound A trains skip 111th Street at all times until Spring 2016. For service to this station, take an A train to 104th Street and transfer to a Lefferts Boulevard-bound A train or take the Q112 bus, days and evenings. For service from this station, take an A train to Lefferts Boulevard and transfer to a Brooklyn-bound A train. Brooklyn-bound A trains will skip 80th Street at all times until Spring 2016. For service to this station, take an A train to Grant Avenue and transfer to an Ozone Park-Far Rockaway-bound A train. For service from this station, take an A train to 88th Street and transfer to a Brooklyn-bound A train. Brooklyn-bound A trains will run express from 145th Street to 59th Street-Columbus Circle from 11:45 p.m. Friday to 6:30 a.m. Sunday and from 11:45 p.m. Sunday to 5 a.m. Monday. A trains will be rerouted via the F line in both directions between West 4th Street-Washington Square and Jay Street-MetroTech from 11:45 p.m. Friday to 5 a.m. Monday. Manhattan-bound A trains skip 104th Street from 11:45 p.m. Friday to 5 a.m. Monday. A trains will run local in both directions between West 4th Street-Washington Square and 59th Street-Columbus Circle from 12:01 a.m. Saturday to 5 a.m. Monday. C trains will be rerouted via the F line in both directions between West 4th Street-Washington Square and Jay Street-MetroTech from 6:30 a.m. to 11:00 p.m. Saturday and Sunday. Brooklyn-bound C trains will run express from 145th Street to 59th Street-Columbus Circle from 6:30 a.m. to 11:45 p.m. Saturday and Sunday. Norwood-205th Street-bound D trains will skip 14th Street and 23rd Street from 12:01 a.m. Saturday to 5 a.m. Monday. E trains will run local in both directions between Forest Hills-71st Avenue and 21st Street-Queensbridge from 12:01 Saturday to 5 a.m. Monday. 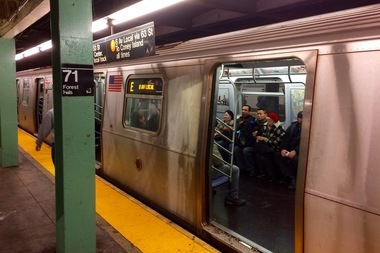 E trains will be rerouted via the F line in both directions between 21st Street-Queensbridge and West 4th Street-Washington Square from 11:45 p.m. Friday to 5 a.m. Monday. Free shuttle buses will run between Court Square-23rd Street and 21st Street-Queensbridge, stopping at Queens Plaza. Coney Island-Stillwell Avenue bound F trains will run express from Smith-9th Streets to Church Avenue from 11:45 p.m. Friday to 5 a.m. Monday. F trains will run local in both directions between Forest Hills-71st Avenue and 21st Street-Queensbridge from 12:01 a.m. Saturday to 5 a.m. Monday. Coney Island-Stillwell Avenue- bound F trains will skip Ditmas Avenue at all times until Spring 2016. For service to this station, take a Coney Island-bound F train to 18th Avenue and transfer to a Jamaica-179th Street-bound F train. For service from this station, take a Jamaica-179th Street-bound F train to Church Avenue and transfer to a Coney Island-Stillwell Avenue-bound F train. Astoria-Ditmars Boulevard-bound N trains will skip 86th Street, Avenue U, Kings Highway, 20th Avenue, 18th Avenue New Utrecht Avenue, and Fort Hamilton Parkway at all times until Spring 2017. To get to 86th Street, Avenue U and Kings Highway, take an Astoria-bound N train to Bay Parkway and transfer to a Coney Island-bound N train. To get to 20th Avenue, 18th Avenue, New Utrecht Avenue and Fort Hamilton Parkway, take an Astoria-bound N train to 8th Avenue and transfer to a Coney Island-bound N train. From these stations, take a Coney Island-bound N train to Bay Parkway or Stillwell Avenue and transfer to an Astoria-bound N train. For New Utrecht Avenue-62nd Street, take the D instead. Transfer to an Astoria-bound N train at 36th Street. L trains will be suspended in both directions between Canarsie-Rockaway Parkway and Myrtle-Wycoff Avenues from 11:30 p.m. Friday to 5 a.m. Monday. Take a free express or local shuttle bus or hop on a nearby A, C or J train. Free local shuttle buses will provide alternate service between Rockaway Parkway and Myrtle Wyckoff Avenues, stopping at East 105th Street, New Lots Avenue, Livonia Avenue, Sutter Avenue, Atlantic Avenue, Broadway Junction, Bushwick Avenue-Aberdeen Street, Wilson Avenue, and Halsey Street. Free express shuttle buses will serve Rockaway Parkway, Broadway Junction and Myrtle-Wyckoff Avenues only, days and evenings.